Key Laboratory of Integrated Regulation and Resource Development on Shallow Lakes, Ministry of Education, Environmental Engineering Department, College of Environment, Hohai University, CHINA. Department of Biochemistry, School of Biological Sciences, University of Cape Coast, Cape Coast, GHANA. Department of Bioscience, University of Milan, Milan, ITALY. Antioxidants present in natural sources helps to scavenge free radicals and thus, provide health benefits. The main objective for this research is to determine phenolic, flavonoid, and alkaloid contents, nitric oxide scavenging activity, hydroxyl radical scavenging activity, and DPPH-scavenging activity, ferric reducing power of the extracts and DNA damage protecting activity to evaluate the antioxidant potential of various extracts. In vitro antioxidant potential of the D. rotundifolia extract was evaluated using 1, 1‑diphenyl‑2‑picrylhydrazyl (DPPH), nitric oxide (NO), and hydroxyl (OH) radical scavenging assays. Ferric reducing power ability of the extract was also examined using tannic acid, and ascorbic acid as standard. Concentrations of plant extracts ranging from 0.02 to 0.10 mg/ml were prepared and mixed with appropriate volumes of reagents. Methanol extract of D. rotundifolia exhibited higher content of phytochemical compounds (alkaloid = 12.4 mg QE/g; flavonoids = 19.3 mg QE/g; and phenols = 18 mg QE/g) at concentration 0.1 mg/ml compare to the aqueous extract (alkaloid = 9.1 mg QE/g; flavonoids = 10.5 mg QE/g; and phenols = 16.5 mg QE/g). An over-all trend found in the present study highlights the fact that the methanol extract have better antioxidant capacities (DPPH, NO, OH and FRAP) than the aqueous extract. D. rotundifolia extracts exhibited considerable protection to the damage of native supercoiled circular at concentrations, 0.1 mg/ml and 10 mg/ml. The study showed that the extracts can competently protect the body against oxidative stress, therefore can be used as a source of potent natural antioxidant compounds. Despite extensive research on the antioxidant properties of most plants, little is known about the many tropical underutilized plants in developing nations especially Ghana. One such plant is Dissotis rotundifolia which is a versatile perennial slender creeping herb. In its native range in Africa, D. rotundifolia is used to treat several illnesses such as dysentery, rheumatism, circulatory problems, conjunctivitis, venereal disease, peptic ulcer and hookworm infestation; it is also used to prevent miscarriages. Extract of D. rotundifolia has also been shown to be effective against Trypanosoma brucei, parasite that causes African sleeping sickness.6 Systematic investigation of extracts of this plant for its medicinal properties could provide an important input to pharmaceutical industry. 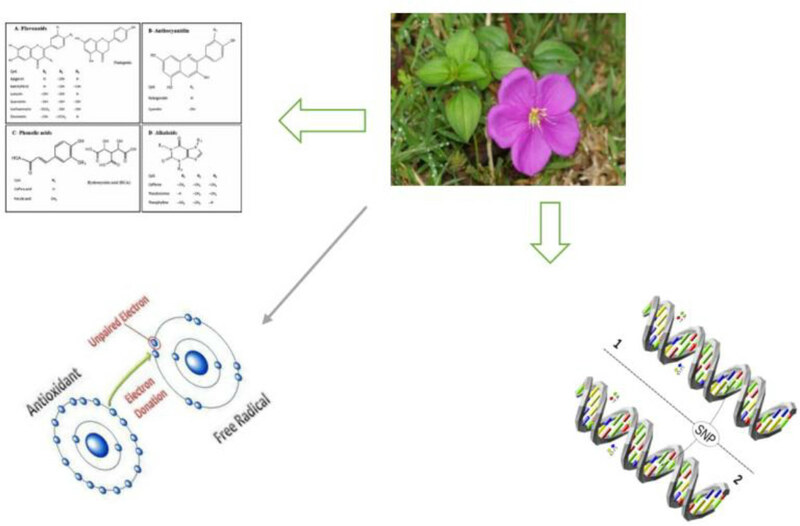 Therefore, in this study, the phytochemical constituent, antioxidant property and protection from oxidative DNA damage by methanol and aqueous extracts of D. rotundifolia plant were investigated to assess the potential protective benefits of this plant against degenerative reactions induced by free radicals. The methanol extract was prepared by soaking 60 g of powdered sample of Dissotis rotundifolia in 210 ml of methanol (70 %) for 72 h at room temperature (35°C). The mixture was then filtered using Whatman filter paper No 1. The filtrate was concentrated under reduced pressure using rotary evaporator at temperature of 46°C. The resulting extract was weighed and stored in airtight bottles at room temperature for further used. The aqueous extract was prepared by soaking 60 g of the powdered sample in 600 mL of sterile distilled water for 2 h in 90°C water bath. The mixture was then filtered using Whatman filter paper No 1. The filtrate was concentrated under reduced pressure using a rotary evaporator at a temperature of 90°C. The resulting extract was weighed and stored in airtight bottles at room temperature for further use. Phytochemical qualitative test of the Methanol extracts of Dissotis rotundifolia was performed as per standard protocols7 to reveal the existence of reducing sugars, proteins, phenolic compounds, flavonoids, tannins, saponins, alkaloids, terpenoids and cardiac glycosides. The total phenolic content was determined using the Folin-Ciocalteu assay described by Meda et al.8 Briefly, 0.5 mL of extract (1 mg/mL) and 2.5 mL of 10 % Folin-Ciocalteu’s reagent solution were mixed. After incubation for 2 min at room temperature, 2.5 mL of 7.5 % sodium carbonate solution was added. The mixture was incubated at 45OC for 45 min and subsequently photometrically measured at 760 nm. Gallic acid (0–100 μg/mL) was used as standard to produce the calibration curve. The mean of three readings was used and the total phenolic content was expressed in milligrams of Gallic acid equivalents (GAE) per gram of plant extract. Ability of the sample extracts to reduce ferric ions was measured according to the modified method described by Oyaizu.10 A mixture containing 2.5 mL of 0.2 M phosphate buffer (pH 6.6) and 2.5 mL of K3Fe (CN)6 (1% w/v) was added to 1.0 mL of various concentrations (0.02–0.10 mg/ml) of extract and standards prepared in distilled water. The resulting mixture was incubated for 20 min at 50°C, followed by the addition of 2.5 mL of trichloroacetic acid (TCA) (10% w/v), which was then centrifuged at 3000 rpm for 10 min. About 2.5 mL of the supernatant was mixed with 2.5 mL of distilled water and 0.5 mL of FeCl3 (0.1% w/v). The absorbance was then measured at 700 nm against a blank sample containing a phosphate buffer. Increased absorbance of the reaction mixture indicated higher reducing power of the plant extract. Where A0 was the blank absorbance and A1 was the mixture containing the extract absorbance or the standard absorbance. Where A260 represents the absorbance at 260 nm and D is the dilution factor. The determination of the concentrations enabled the standardization to 100 ng/µl. Samples that were highly concentrated were diluted with sterile Tris‑EDTA (TE) buffer, whereas those with lower concentrations, the extraction process was repeated. DNA protection potential of the extracts were evaluated using cowpea (Vigna unguiculata) genomic DNA. Genomic DNA was extracted following the cetyl trimethyl-ammonium bromide (CTAB) procedure as described by Doyle and Doyle.15 Oxidative damage to DNA was induced using hydroxyl free-radical generating system (H2O2/UV) described by Russo et al16 in the presence of the extracts. Briefly, 10µl aliquot of cowpea DNA was added to microfuge tubes containing 10µl of different concentrations of extracts (0.02, 0.1, and 10 mg/ml) and 10µl of 30% H2O2. Tannic acid (10 mg/ml) was used as a positive control instead of the extract. The normal control contained only the DNA extract while the negative control contained DNA plus H2O2. The tubes were UV irradiated using UV transilluminator (UVP Upland, CA 91786 U.S.A.) for 12 h at room temperature. After irradiation, 5µl of X6 bromophenol blue was added to each tube. All samples were analyzed by gel electrophoresis on 1% agarose gel (containing ethidium bromide) in TAE buffer (pH 8). Untreated, un-irradiated cowpea DNA was run along with untreated UV-irradiated DNA and an extracts treated UV-irradiated sample. All tests were conducted in triplicate. Data are reported as means ± standard error (SE). Results were analyzed statically by using Microsoft Excel 2010. Accurately, methanol and aqueous extracts from D. rotundifolia whole plant retains a percentage yield of 5.602 % and 10.003 % respectively. It was recognized that aqueous extract had greater % yield than that of the methanol extract. Phytochemical analysis of both the methanol and aqueous extracts of D. rotundifolia revealed the presence of reducing sugars, proteins, phenolic compounds, flavonoids, tannins, saponins, alkaloids, terpenoids and cardiac glycosides, but no Phytosterols (Table 1). Phytochemical constituents of methanol and aqueous extracts of D. rotundifolia. Total alkaloid, phenol and flavonoid Contents of aqueous and methanol extracts of D. rotundifolia. There were different compositions of phytochemicals in the extracts of D. rotundifolia (Table 1 and Figure 1). 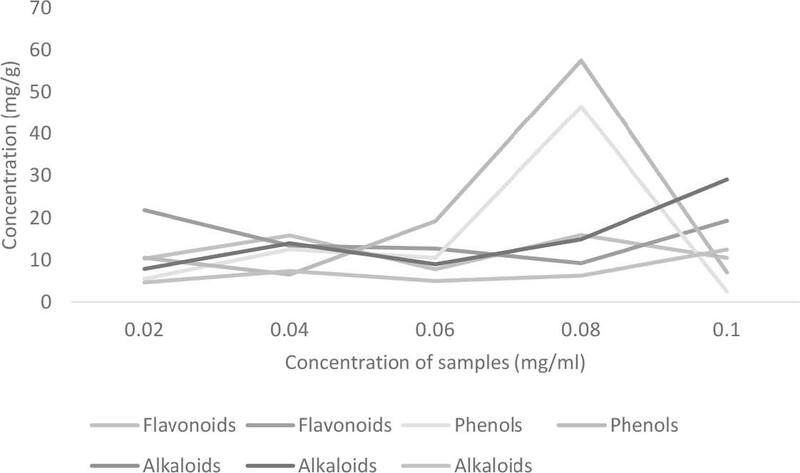 There were no significant differences statistically in the levels of flavonoids, and phenols between the aqueous and methanol extracts of D. rotundifolia (Table 2). There was a statistically significant difference in the levels of alkaloids between the methanol and aqueous extracts of D. rotundifolia (Table 2). The alkaloids begin to reduce and their concentrations weaken as the plants mature. DPPH scavenging activities of methanol and aqueous extracts from Dissotis rotundifolia whole plant and standard tannic acid and ascorbic acid. Figure 3 represents the hydroxyl radical scavenging activity of methanol and aqueous extracts as well as standard Gallic acid. Gallic acid exhibited highest hydroxyl radical scavenging activity compared to the extracts. The extracts exhibited strong NO scavenging activity compared with standard Gallic acid (Figure 3). Both standard Gallic acid and extracts show dose dependent inhibition of the NO radicals. The aqueous extract again shows higher activity (59.87 %) compared to methanol the extract which shows 51.16% inhibition at the highest concentration of 0.1 mg/ml. Hydroxyl scavenging activities of both methanol and aqueous extracts from Dissotis rotundifolia whole plant and standard Gallic acid. Gallic acid recorded the highest % radical scavenging ability, followed by aqueous extract and methanol extract, i.e. 42.48%, 24.88%, and 23.18% (Figure 4) respectively for the highest concentration tested (100µg/ml). The NO radical scavenging activity of Dissotis rotundifolia whole plant may help arrest chain reactions initiated by excess generation of ONOO- that is detrimental to human health. Nitric oxide scavenging activities of methanol and aqueous extracts from Dissotis rotundifolia whole plant and standards, tannic acid and Gallic acid. 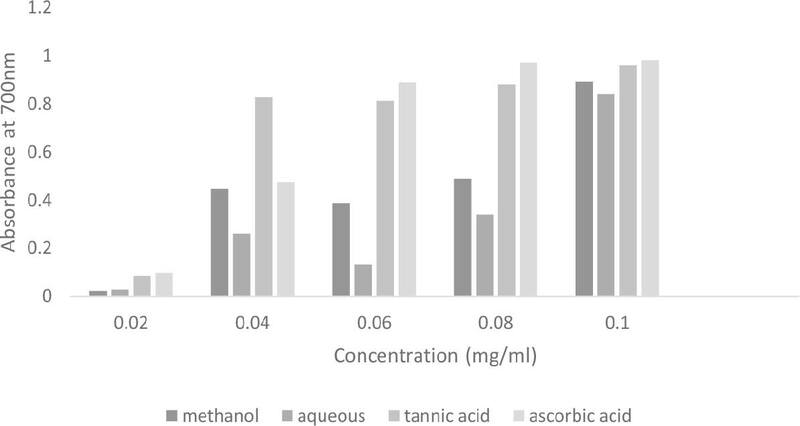 Figure 5 shows the results of the FRAP assay of methanol and aqueous extracts of Dissotis rotundifolia whole plant. The methanol extracts of the D. rotundifolia showed significantly higher FRAP values compared to all of the aqueous extracts. An over-all trend found in the present study climaxes the fact that the methanol extract have better antioxidant capacities than the aqueous extract. Ferric Reducing power of methanol and aqueous extracts from Dissotis rotundifolia whole plant and standards, tannic acid and ascorbic acid. Figure 6 shows the electrophoretic pattern of DNA after UV-photolysis of H2O2 (100 mM) in the absence and presence of different concentrations of methanol and aqueous extracts of D. rotundifolia whole plant (0.02, 0.1, and 10 mg/ml). 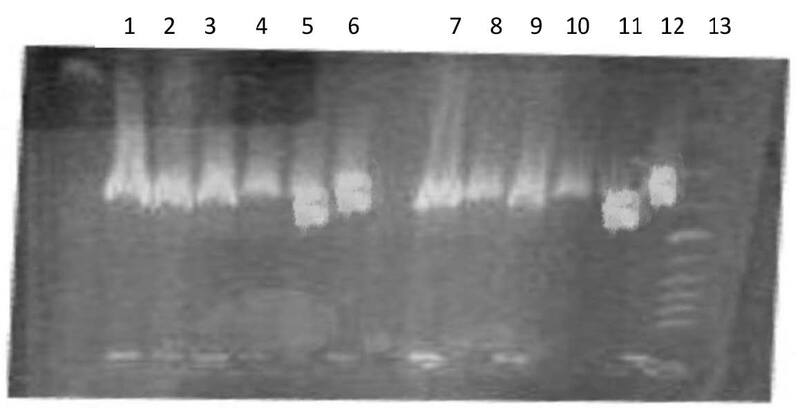 Electrophoretic pattern of DNA after UV-photolysis of H2O2 in the presence or absence of methanol or aqueous extracts from Dissotis rotundifolia whole plant.). Lane 6and12: control (DNA only), lane 5and11: treated (DNA+H2O2), lane 4and10: untreated (DNA+ extracts), lane 3 and 9: treated (DNA+10mg/ml extracts+H2O2), lane 2and8: treated (DNA+0.1mg/ml exracts+H2O2) and lane 1and 7: treated (DNA+ tannic acid+H2O2) and lane 13: marker. DNA derived from leaves of cowpea showed two bands on agarose gel electrophoresis (line …), the faster moving prominent band corresponding to the native supercoiled circular DNA and the slower moving very faint band is the open circular form. The UV irradiation of DNA in the presence of H2O2 resulted in the scission of supercoiled DNA to give prominent open circular DNA and a faint linear DNA (lanes 5 and 11), an indication that OH· was generated from UV photolysis of H2O2. The addition of methanol and aqueous extracts of D. rotundifolia to the reaction mixture of H2O2 displayed considerable protection to the damage of native supercoiled circular DNA (lanes 2,3, 8 and 9) with the aqueous extract doing better than the methanol extract. In the present study, we used 2 different extracting solvents (methanol, and water), and we found out that they differed considerably in their capability to extract antioxidants. Conventionally, solvents such as methanol, ethanol, and acetone have been routinely used to extract phenolic/antioxidant compounds from fresh plants at different concentrations in the presence of water17 used plays a substantial character in the precise quantification of antioxidants, it is very tough to compare the data available in the literature.17 Nevertheless, generally, solvents such as methanol, ethanol, and acetone have different polarities, vapor pressures, and viscosities; solvents with low viscosity have low density and high diffusivity, which can allow them to with no trouble diffuse into the pores of the plant materials to leach out the active constituents.18 Furthermore, dissimilarities in antioxidant activity and the yield of phenolic compounds have been testified to be influenced by extracting solvents.19 Considering the variable results which can be obtained during extracting of antioxidants using various solvents, it is quite difficult to develop a standard extraction protocol that can provide better or more consistent results. From the toxicological point of view water is considered to be safer than methanol,20 particularly with regard to applications or use in the food industries. However, in general, the least polar solvents are considered to be most suitable for the extraction of antioxidant compounds, unless very high pressure is employed. Environmental influences such as soil type, growing season, geographic location, and mineral status are known to impact intensities of plant secondary metabolites.23 D. rotundifolia extracts that exhibited great altitudes of phytochemicals may be strong to insects and diseases using the phytochemicals as protective chemicals.24 Vaclavikova et al. (2008)25 in recent times demonstrated that anti-oxidant possessions of flavonoids and their ability to chelate free metallic ions could be operational in reducing the poisonousness of Doxorubicin (DOX) 39. The presence of flavonoids and phenols in D. rotundifolia makes the plant a very potent antioxidant. Although both extracts shows DPPH scavenging activity, the activity is lower compared to the standards (tannic acid and ascorbic acid). The methanol extract shows higher activity (37.03%) compared to the aqueous extract which shows 23.09% inhibition at the highest concentration of 0.1 mg/ml. DPPH is a stable free radical commonly used to investigate the scavenging activity of phytochemicals. This result agrees well with the result on total phenolic content which is higher in the methanol extract. Usually, high total phenol contents lead to better DPPH-scavenging activity.26,27 Furthermore, this result is consistent with other findings26 where methanol extract showed higher antioxidant activity over aqueous extract. Hydroxyl radical is the most reactive oxygen centered species and causes severe damage to adjacent biomolecule. Similarly to reactive oxygen species, NO is also implicated in inflammation, cancer and other pathological conditions.28 NO is a very unstable species under aerobic conditions. 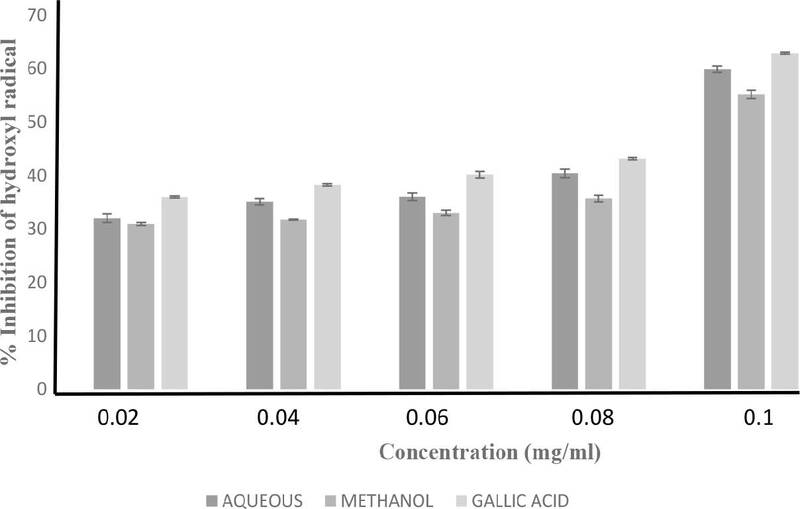 The extracts exhibited strong NO scavenging activity compared with standard Gallic acid (Figure 3). The DPPH, hydroxyl and NO radicals scavenging activity of the extracts may be due to the presence of hydrogen donating ability of phenolic compounds in the extracts. The FRAP assay is mostly labored to measure the antioxidant influence of any substance in the reaction medium, as its reducing ability. Naturally present antioxidants are deliberated as reductants, and the inactivation of oxidants by reductants is described as a redox-reaction.29 An over-all trend found in the present study climaxes the fact that the methanol extract have better antioxidant capacities than the aqueous extract. A conceivable reason for this dissimilarity is that methanol and aqueous accumulate different quantities of phytochemicals, which in turn can affect the level of antioxidants present. The results of this study indicate that extracts of D. rotundifolia whole plant contain a variety of phytochemical compounds that can competently protect the body against oxidative stress caused by free radicals and might therefore be used as a source of potent natural antioxidant compounds. The study also showed the DNA damage protective potential of the extracts, which could be used in disease therapy, thus, cancer prevention and related. The antioxidant activity of D. rotundifolia may justify further investigation of its other beneficial biological properties and determine its safety. The authors are grateful to the College of International Education, Hohai University, Nanjing, China and Biochemistry Research Laboratory, Department of Biochemistry, School of Biological Sciences, University of Cape Coast, Cape Coast, Ghana for their support. 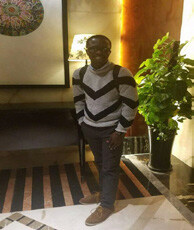 Williams Kweku Darkwah was the recipient of a scholarship from the China Scholarship Council (CSC) for the duration of this work. Antioxidants are natural sources that help to scavenge free radicals. Extracts of D. rotundifolia whole plant contain a variety of phytochemical compounds in appreciable quantities. 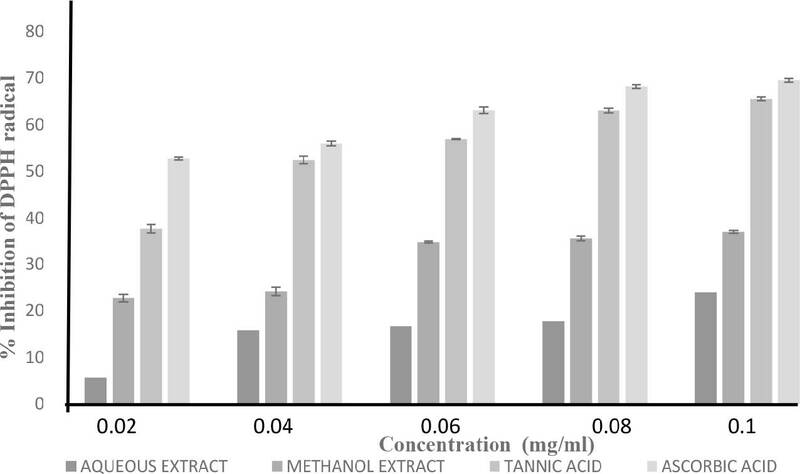 Methanol extract exhibited better antioxidant capacities (DPPH, NO, OH and FRAP) than the aqueous extract. D. rotundifolia extracts exhibited considerable protection to the damage of native supercoiled circular. herefore D. rotundifolia extracts can be used as a source of potent natural antioxidant compounds. Williams Kweku Darkwah: Key Laboratory of Integrated Regulation and Resource Development on Shallow Lakes, Ministry of Education, Environmental Engineering Department, College of Environment, Hohai University, CHINA. Cite this article: Darkwah WK, Ao Y, Adinortey MB, Weremfo A, Abrokwah FK, and Afriyie E. Total Phenolic, Flavonoid and Alkaloid Contents, Oxidative DNA Damage Protective and Antioxidant Properties of Methanol and Aqueous Extracts of Dissotis rotundifolia Whole Plant. Free Radicals and Antioxidants. 2018;8(2):82-8.